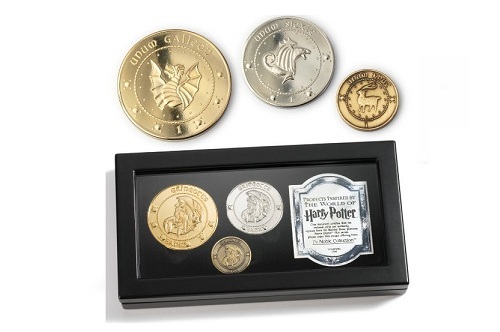 A set of Gringotts bank coins are beautifully recreated and set in a collector's coin sleeve. Each Galleon, Sickle and Knut is individually struck in rich detail and plated in either 24 karat gold, silver or copper. A set of Gringotts bank coins beautifully recreated and set in a collector's box. Harry Potter collectible from The Noble Collection. A set of Gringotts bank coins beautifully recreated and set in a collector's box.